The clever girls (Katie Jacobs and Valerie Hammond) in my design department came up with a rock-star idea of creating our own party for the upcoming June issue. Our usually simple Staff Salvation was taken to a new level. They brought out all of the stops—and oh yeah, the PROPS, to make my brand new front yard an ideal place for an Americana-themed party. Lots of set up, but the 'after' offers a definite WOW factor. This type of set up requires quite a bit of planning and even more loading and unloading of all of the goods to give it that authentic feel. 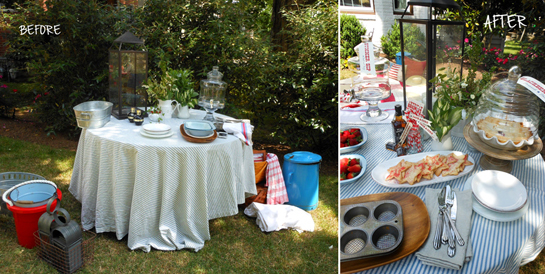 From dishes to linens to an actual red-wagon—these ladies thought of everything. 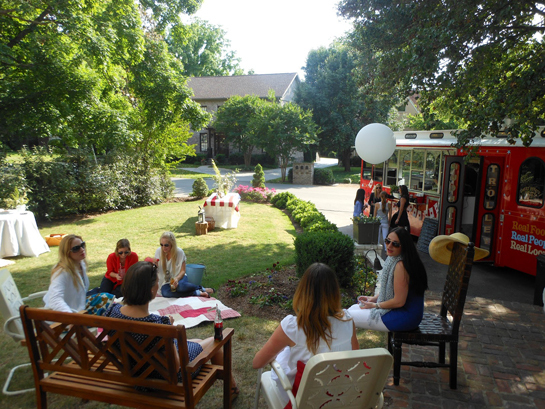 You can read about all the planning for putting together your own summer party in the next issue of Nashville Lifestyles, but I wanted to share a bit of the behind-the-scenes from our super-summery day (record high temps for May!). The centerpiece for our gathering was the new food trolley from Puckett's Grocery. 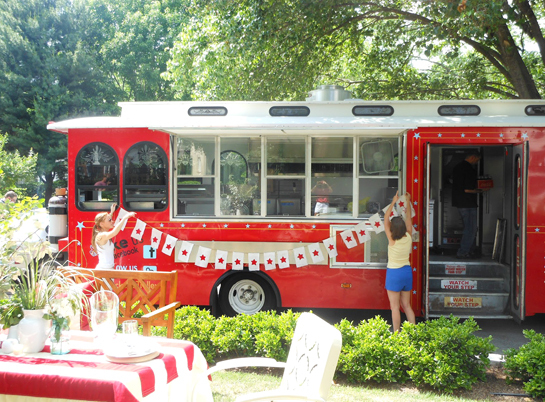 This isn't your typical food truck, but a truly over-sized restaurant on wheels. The sweet Hannah Tate of Puckett's got us going, came up with a menu. and put their best staffers to work our party (thank you J.T., and Kevin). Even those on our team who usually stick to salads and light fare were indulging in homemade peach cobbler and deep fried Oreo cookies. The fun part is you can rent this trolley and design your own menu for any party. Having their BBQ ribs, sweet potato fries and squash casserole at any gathering is a snap, and there is zero clean up since it all goes with the truck. Genius! Chambord Lemonade is a crowd pleaser. Loved having my magazine team to the house for some (much deserved) late afternoon fun. The most important ingredient to any gathering is not the food or the decor, but in my opinion, the people and the vibe. For our team, that's always the easy part...thank goodness! We have two great summer playlists up right now at Nashville Lifestyles Spotify: Summer Mix and Country Summertime to get you inspired for your own festivities. 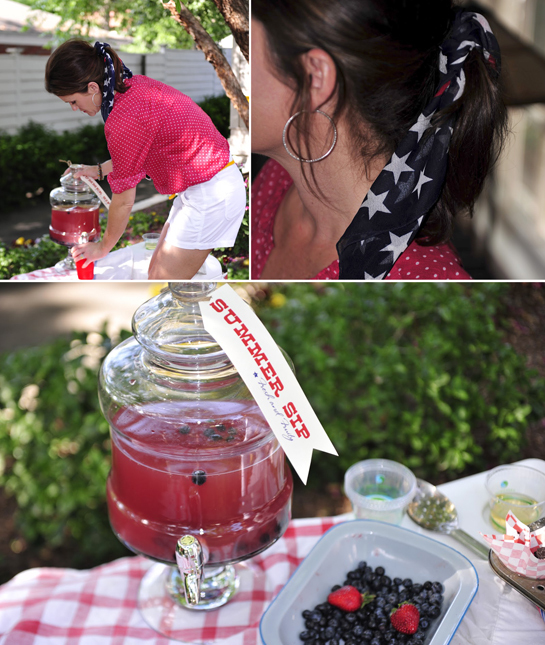 What summer party ideas are you working on? Don't forget to click the side bar and start following the Southern Sophisticate! These pictures are so lovely! I love the food truck idea coupled with Americana theme.